uuid : b63822c7-8474-4a40-a472-082d3c82021b templates_id: 119457 templates_uuid: "622e9db9-2d02-4b3d-a328-5c14998a86b1" title: "Employment Contract Template - Free Contract Of Employment" display_name: "Contract of employment" meta_keywords: "Job contract, Employment agreement or Employment contract" description: "
Employment contracts are not only a legal necessity, they can also help set the tone of your business. This straightforward contract of employment is a great way to layout clear expectations for the employer and employee, laying the foundations for a mutually rewarding relationship. It can be used for permanent employees or fixed-term, temporary employees. Good employment contracts cover key areas such as pay, benefits, hours, holiday, sickness and termination. An employment contract is an agreement between the employer and employee setting out the employee\'s employment rights, responsibilities and duties. Do I need an employment contract? Employers are legally required to give employees who have worked for one month or more a written statement of employment particulars. This must be done within two months of the start of the employment. This employment contract complies with the requirement for a written statement and can be adapted for full-time or part-time permanent employees and for fixed-term employees. Employment contracts must be compliant with the Employment Rights Act 1996, the Employment Act 2002 and the Equality Act 2010. How can the employee\'s place of work be moved? If you are likely to move premises in the future or operate from more than one site, you should specify this in the employment contract so that you have the right to move the employee to a new place of work. Without this right, it will be up to the employee whether to agree to the move and refusal may cause legal and practical problems. To make the right to move employees more reasonable and acceptable, it is usual to put some geographical limit on the area within which the place of work can be moved. This employment contract allows you to specify the the regions in which the employee may be expected to work. Which takes priority, the offer letter or the employment contract? When there is both an offer letter and a separate employment contract, it\'s important to say which document takes priority if there is any difference. This employment contract says that the contract will take priority over the offer letter. Is a separate job description needed? Using a separate job description works best if you want to give a detailed description of the job and so can help bring clarity, particularly for mid-level to senior employees. However, you should only reference a separate job description if it will genuinely be created in practice. Otherwise, it\'s better just to put a brief explanation in the employment contract. This employment contract allows you to reference a separate job if needed or just describe the duties in the contract itself. What\'s the point of including a \'probationary period\'? For new hires, it is helpful to the employer to have a probationary period (usually 3 months) during which the employee can be assessed. It is unusual (but not impossible) to use a probationary period when an existing employee enters into a new employment contract. You can decide how long you want the probationary period to be. The option to extend the probationary period (usually for another 3 months) is helpful when employees have not proven themselves during the initial period or have been absent. Probationary periods will not stop the employee from gaining unfair dismissal rights when they reach the qualifying service. This employment contract allows for a probationary period if needed, and for the probationary period to be extended. How many hours can the employee legally be required to work? This employment contract allows you to specify regular or irregular hours of work - for example, 9 am - 5 pm Monday - Friday or a certain number of hours per week, at times to be agreed. Check the employee is not working more than 48 hours a week, averaged over 17 weeks. This is the legal maximum including work for other employers. If an employee works at or close to the maximum, ask them if they are willing to opt-out from the 48 hour limit. If not you must take reasonable steps to ensure that working time stays under the limit. Employees also cannot work for more than 13 hours a day and must either have 24 hours\' continuous rest a week or 48 hours a fortnight. Is there a minimum holiday entitlement set by law? Employees are legally entitled to at least 5.6 weeks\' paid holiday a year. For an employee working five days week, this equates to 28 days including bank holidays. Employers can agree to a greater holiday allowance. Part-time Employees are entitled to a pro-rata entitlement (eg an employee working three days per week would be entitled to 16.8 days\' holiday). Is the employer legally required to make a pension provision? It will be mandatory for all employers to make compliant pension arrangements before 1 February 2018 (exactly when depends on how many staff you have). Some employers must already do this. From 1 October 2012, employers must enrol employees into either the National Employment Savings Trust or another qualifying pension scheme (\'Auto-enrollment\'). However, employers with fewer than 250 employees on payroll (including any employees of other entities who share payroll) on 1 April 2012, must Auto-enrol only from an assigned date between 1 April 2014 and 1 February 2018. The previous requirement to provide access to a designated stakeholder pension scheme (the \'Stakeholder Law\') has been repealed and, currently employers without a designated stakeholder pension scheme have no obligation to provide pension access until they become subject to Auto-enrollment. However, if you had already made pension arrangements under the Stakeholder Law then you may have to continue those arrangements if you have any employees who have already chosen to participate in that scheme. This employment contract allows you to choose from a variety of possible pension arrangements. Should a fixed term contract be used? Fixed-term contracts (ie contracts which end on a specified date rather than continuing indefinitely) can be useful where it is known from the outset that the employment will end after a defined period. Fixed-term employees are protected by law from being treated less favourably than permanent employees and, if they have sufficient length of service, from unfair dismissal. Fixed-term contracts that are renewed or replaced after four years\' qualifying service are automatically converted into a contract of indefinite duration. This employment contract allows you to choose fixed-term or employment for an indefinite period. The minimum permissible notice period from two months\' service until two years of service is one week. It is common to say that one week\'s notice will apply during the probationary period. Until two months service it is lawful to provide for termination without notice but this is unusual. This employment contract allows the notice period to be specified, although the employer cannot offer less than the statutory minimum. This employment contract is governed by the law of England and Wales.
" created_timestamp: "2018-10-08 04:36:01.0" modified_timestamp: "2018-10-08 04:36:01.0" active: true created_by: 236 modified_by: 236 dcm_id: 42 url_slug: "Employment-contract" meta_description: "Make a free employment contract using our step-by-step interview. Make your contract of employment online today with our free employment contract template. Use this employment contract to hire employees and start the basis for an employment relationship." time_to_complete: "20 minutes" role1: "Employer" role2: "Employee"
An employment contract is an agreement between the employer and employee setting out the employee's employment rights, responsibilities and duties. How can the employee's place of work be moved? When there is both an offer letter and a separate employment contract, it's important to say which document takes priority if there is any difference. Using a separate job description works best if you want to give a detailed description of the job and so can help bring clarity, particularly for mid-level to senior employees. However, you should only reference a separate job description if it will genuinely be created in practice. Otherwise, it's better just to put a brief explanation in the employment contract. What's the point of including a 'probationary period'? This employment contract allows you to specify regular or irregular hours of work - for example, 9 am - 5 pm Monday - Friday or a certain number of hours per week, at times to be agreed. Check the employee is not working more than 48 hours a week, averaged over 17 weeks. This is the legal maximum including work for other employers. If an employee works at or close to the maximum, ask them if they are willing to opt-out from the 48 hour limit. If not you must take reasonable steps to ensure that working time stays under the limit. Employees also cannot work for more than 13 hours a day and must either have 24 hours' continuous rest a week or 48 hours a fortnight. Employees are legally entitled to at least 5.6 weeks' paid holiday a year. For an employee working five days week, this equates to 28 days including bank holidays. Employers can agree to a greater holiday allowance. Part-time Employees are entitled to a pro-rata entitlement (eg an employee working three days per week would be entitled to 16.8 days' holiday). It will be mandatory for all employers to make compliant pension arrangements before 1 February 2018 (exactly when depends on how many staff you have). Some employers must already do this. From 1 October 2012, employers must enrol employees into either the National Employment Savings Trust or another qualifying pension scheme ('Auto-enrollment'). However, employers with fewer than 250 employees on payroll (including any employees of other entities who share payroll) on 1 April 2012, must Auto-enrol only from an assigned date between 1 April 2014 and 1 February 2018. The previous requirement to provide access to a designated stakeholder pension scheme (the 'Stakeholder Law') has been repealed and, currently employers without a designated stakeholder pension scheme have no obligation to provide pension access until they become subject to Auto-enrollment. However, if you had already made pension arrangements under the Stakeholder Law then you may have to continue those arrangements if you have any employees who have already chosen to participate in that scheme. Fixed-term contracts (ie contracts which end on a specified date rather than continuing indefinitely) can be useful where it is known from the outset that the employment will end after a defined period. Fixed-term employees are protected by law from being treated less favourably than permanent employees and, if they have sufficient length of service, from unfair dismissal. Fixed-term contracts that are renewed or replaced after four years' qualifying service are automatically converted into a contract of indefinite duration. This employment contract allows you to choose fixed-term or employment for an indefinite period. The minimum permissible notice period from two months' service until two years of service is one week. It is common to say that one week's notice will apply during the probationary period. Until two months service it is lawful to provide for termination without notice but this is unusual. More than just a Contract of employment template, our step-by-step interview and guidance makes it easy to create your document. Easily create online, download, print and sign your free Contract of employment in minutes. 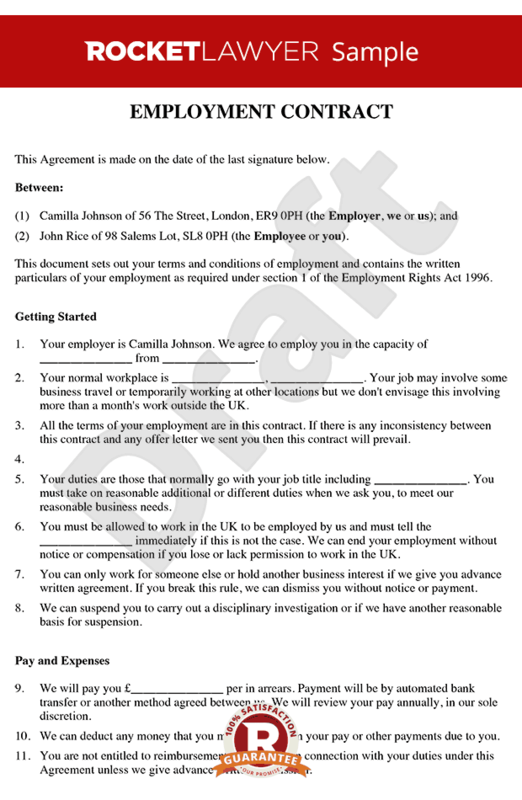 This document is also sometimes called: Job contract, Employment agreement or Employment contract.